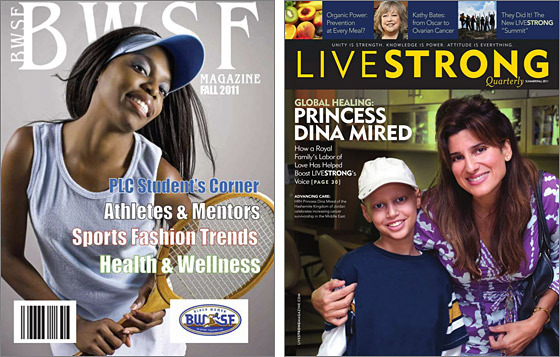 Print magazines from the nonprofits Black Women in Sport Foundation and Livestrong. Target audience: Nonprofits, cause organizations, foundations, NGOs, social enterprises, educators, Web publishers. For all nonprofits, digital should be the top priority for communications and public outreach. But new technologies now give you more options for reaching existing and potential supporters. One of those options may surprise you: a print-on-demand magazine. Mid-size and large nonprofits routinely produce monthly or quarterly print magazines as part of their mission. Consider Livestrong Quarterly, which debuted in 2009 and is powered by HP MagCloud technology (more on that tomorrow), as well as such nonprofit stalwarts as Consumer Reports, National Geographic, Smithsonian and AARP Magazine, which boasts the third largest circulation of any magazine in the world. 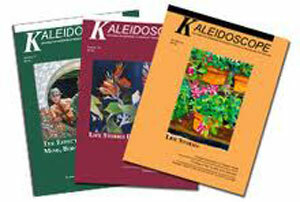 Smaller nonprofits have also joined the fun: There’s Kaleidoscope magazine, published by United Disability Services, Natural Transitions Magazine, published by Natural Transitions, and BWSF Magazine, recently launched by The Black Women in Sport Foundation (download their inaugural issue as a PDF). Now, we’re not suggesting that you begin publishing a monthly magazine to add to your nonprofit’s plate (although if you do, please let us know!). But let’s get creative for a second. For the first time, you can now print an on-demand, high-quality, full-color magazine to tell your organization’s story, whether it’s tied to a fundraising event, direct mail appeals, an annual report, the opening of a new store (think Goodwill or Salvation Army) — the possibilities are almost limitless. The evidence suggests that most people want to experience both print and digital communications. Give them want they want, and they’ll be more likely to support and follow your cause. According to multiple surveys and market research, the tactile sensation of holding a magazine or any paper product and being able to touch and smell its pages is something most people still value — even digital natives and tech geeks. Different media work in different circumstances. While millions of Americans now read on smartphones and tablets when they’re on the go, many prefer print when reading at home. Another good thing about printed products is that they provide a much-needed break from the fast-paced onslaught of tweets, emails, ads and IMs. When someone reads your print magazine, they’ll be less likely to get distracted and more likely to absorb your message, update or fundraising appeal — and to take action. If you’re considering publishing a magazine for your nonprofit or social enterprise, it doesn’t need to be in print form, of course. Current and developing technologies make digital magazines — say, for the iPad — accessible and enjoyable, especially with the increasing numbers of people with tablets. But you’re no longer restricted to one or the other. Publish your magazine online — and in print. Then promote it using social media. Publishing a magazine isn’t something you want to enter into without a plan that covers such topics as who’ll write the content? Who’ll take the photos? Who’ll design the look? (Often, a combination of staffers and contractors.) And most importantly, who are you trying to reach, why, and how? Here are six business goals and organizational missions that a magazine can help advance. See if some of these make sense for your organization. 1To get new members and keep current donors. Having something tangible (and well-produced) could be impressive to people considering whether they want to join or support your organization. People you meet will be more likely to remember your nonprofit with a publication than if you simply give them a business card. 2To increase donations. “The majority of individual donor fundraising is still done via print,” Leroux Miller says. Even though many online fundraising tools exist, calls to action in print are still driving people to give money. Recent research shows that online works for attracting donors, but it is not as successful at keeping them. For example, many donors acquired through the Internet are switching to giving through direct mail. 3To build a community around your cause. “Print retains the ability to impress and persuade in a way that some other media do not,” magazine professional Cable Nehaus said. To sustain communities, regular communication is necessary; magazines can provide that and can complement other (read: digital and mobile) strategies. 4To educate your audience. “Magazines could work for very specialized groups, on specialized topics,” Leroux Miller said. “It has to be the kind of thing that isn’t necessarily super-timely (people go online for that), but still provides some real value.” Magazines could be a unique way to inform your audience about specific issues. In the United Kingdom, many NGOs are sending correspondents to do foreign reporting. 5To serve underrepresented readers. Not everyone is online, which can be an odd thing to remember when your life is basically lived online. For some nonprofits, spending all day on Facebook is a mistake. Think about your community. 6To get your readers to take action. This is the most important reason of all — a call to action that’s right on your supporter’s end table. “[Magazines] have a certain existential ‘weight,’ particularly if they are smartly done,” Nehaus said. “The very fact that an [organization] publishes a magazine sometimes can convey the impression that the [organization] is serious about its mission.” If people believe your organization is serious, they will be more likely to take action and help your cause. Magazines are highly specialized, which is an important thing to consider when thinking about publishing one. Let’s say you want to go for it. Today, you have two options: traditional publishing with an outside company doing most of the work or self publishing, which allows you to be as involved as you want, depending on your budget and the talent already available to you. In part 2, we’ll cover how to publish a magazine using one of these methods. But we encourage you to start thinking about ways your nonprofit can continue to use print as part of your communication and marketing plans. • A step-by-step guide to creating a media strategy (Socialbrite)Lindsay Oberst is a freelance writer who writes about art, culture and topics that relate to social and environmental good. Follow her on Twitter at @LindsayOSocial for social good discussions or at @LindsayOWrite to chat about writing. Nice article, Lindsay. I’d love to hear examples from any nonprofits or social enterprises that put out one-off magazines or color print newsletters. I can think of lots of opportunities for this kind of communication outreach.